You can check out a little synopsis of the brew day on this post: Double Brew for Shegogue. 3oz of Warrior 15.8%AA - 60 minutes - 100 IBUs? 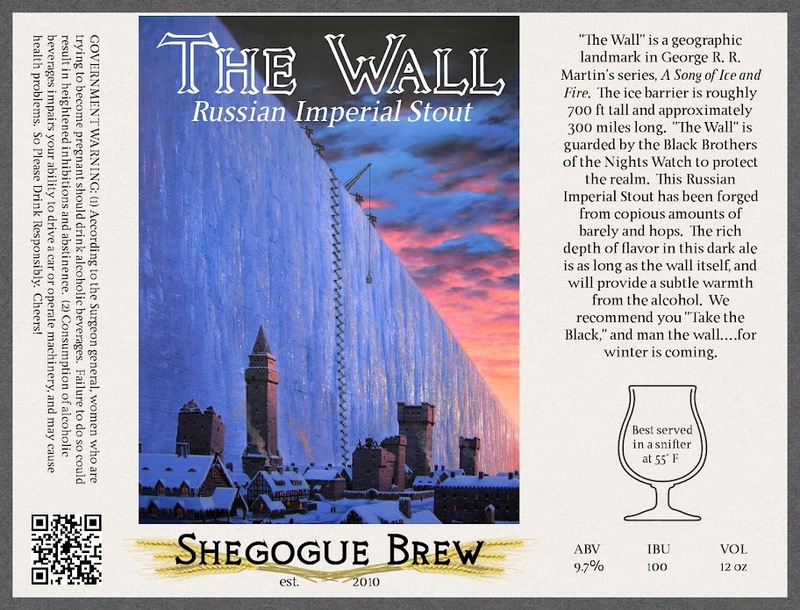 Tasting Notes: The Wall pours almost pitch black in the glass, but held up to the light you can get a glimpse of a very dark brown (like the stain of a dark walnut wood) color. The head on the beer is a dark tan and provides lacing while drinking. The beer has a bunch of different smells that I picked up on - coffee, chocolate, a dark fruitiness (grapes?) and a sweet malt aroma. 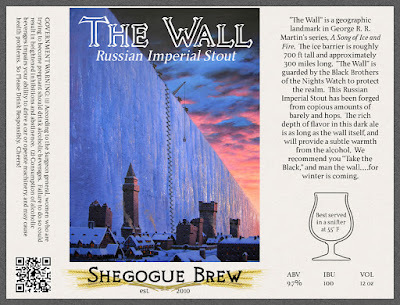 The Wall has a firm bitterness upfront, which is accompanied by moderate carbonation, and leads to the complex chewy flavors already perceived in the aroma. The bitter from the hops and roasted malts packs a punch on the taste buds and invites the drinker back for another sip! This beer should continue to age and improve. If you received one of these as a gift I look forward to hearing your tasting notes in the comment section below! I missed this post somehow - love the label! I need to brew an RIS or two this year..how do you like your recipe? Thanks! This recipe was Jamil's from BCS. I think the recipe is pretty solid. I brewed it in July and the bitterness is just now starting to get close to balanced. As the bitterness subsides it the beer is a little fuller than I'd like, but is definitely easy drinking (which is dangerous). When I brew it again (which i hope to make a yearly occurrence) I might mash a degree or two lower to make a it a bit drier. The beer is very rich from the caramunich, special b, and chocolate, but I think the percentages are a good balance. There are so many variables and balancing acts with this type of beer, especially when it comes to "how do I went it to taste in x months/years" that I think I will stick with this recipe until I have a few batches under my belt. I keep sampling it and it continues to change so much, I should probably be keeping better, and multiple, tasting notes.